The arrival of Amazon.com’s Kindle for iPhone app certainly raises the profile of Apple’s handheld wonder as an e-book platform. Of the many fine things the iPhone is already—planner, organizer, Internet and e-mail portal, MP3 player… and, oh yeah, a phone—add reading tool to the list. Partisans of the Kindle (and now the Kindle 2) insist that Amazon’s reader makes for a superior reading experience. They say it’s all in the e-ink display. And in some respects, that’s true. But even if its LCD screen can’t match e-ink, the iPhone still has a very readable display. More important, readers don’t lack for app options if they’d like to crack open a good book on their mobile device. Here’s an overview of the many good reading options on the iPhone and iPod touch. The goal of every reader app should be to make the reading experience as easy on the eyes as possible. The interface should be clean and the text should be fully scalable, with a wide variety of typefaces, text colors and backgrounds to choose from. You should be able to read in either portrait or landscape mode. In a perfect world, every book would look like the volumes formatted so elegantly for Classics. When you launch Classics, a bookcase appears with books facing outward. Tap a cover and the book opens. Touch and hold a book and rearrange the shelves to your liking (with 16 books as of this writing, it doesn’t take long). Tap a page and the page flips. You can also drag your finger and the page will turn as realistically as a virtual book will allow. Tap the table of contents button and jump easily from chapter to chapter. A bar at the top of the screen displays your progress. When you’ve finished reading, a crimson bookmark slides down the left side of the page and the book closes. Neat. But although the type is beautifully rendered and easy enough to read, you cannot adjust the type size. Stanza isn’t as elegant as Classics, but it has some classy touches—notably, the landscape library view. The app is more versatile with type than just about any of the e-book apps currently available. Although eReader lets you adjust type, spacing, margins and colors, that app isn’t quite as customizable as Stanza. For example, you’re limited to six font sizes, ranging from “small” to “gigantic.” The iFlow readers offer a clean and easy to use interface, with about 50 different adjustable typefaces, and nearly two-dozen text colors and backgrounds to choose from. BookShelf offers some interesting customizable features, including a choice of more than 20 scalable typefaces and an array of background colors, but it’s awfully utilitarian in look and feel. Kindle is easy on the eyes, though not as pretty as other apps. And unlike eReader or Stanza, the Kindle app is minimally customizable—you can adjust the type size and that’s about it. The ideal reading app would be one that you can use to read books, magazines, and newspaper articles seamlessly and transparently in every format imaginable. And, for goodness sake, avoid digital rights management if at all possible. Both Stanza and eReader support a variety of file types. With Stanza, you can download books from more than a dozen sources, including Project Gutenberg’s online library of more than 27,000 copyright-free books. You can import your own library, including ePub, eReader and PDFs using Stanza’s desktop application. And if that weren’t enough, the app also doubles as an RSS reader. The Kindle app doesn’t read anything but books purchased from Amazon.com. But it does give iPhone and iPod Touch users easy access to Amazon’s 250,000-plus selection of books, as well as the experience of blazing fast book downloads. That’s no small thing. Both Stanza and eReader support downloading purchased books from Fictionwise.com and eReader.com. However, one clear advantage Kindle has right now is price. Prices for most Kindle books are 25 to 50 percent lower compared to other e-book retailers. But that could change. Barnes and Noble on March 5 announced that it bought Fictionwise for $15.7 million and plans to launch a new e-book store later this year. Some competitive pricing, especially in a down economy, could make e-books even more interesting in the coming months. Classics comes with the books baked right in. Although the developers promise more content with each update, only a book bag’s worth of great books are currently available; you cannot import any books of your own. The one obvious downside of the BeamItDown’s excellent iFlow-based book collections is that they’re all separate apps that litter your home screen. And you cannot currently import your own books. BookShelf supports numerous Palm e-book formats, though it doesn’t support iSilo or eReader files. Along with fully adjustable text, a reader should have total control of the reading experience. If you want to simulate flipping the pages of a book, then the app should let you flip the pages. If you’d rather save time and turn pages with a single tap, you should be able to do that. If your thumbs are prone to cramping, then you should have the option of tilt scrolling, as you can with Instapaper Pro. Stanza is more easily customizable than its competition. Readability is never, ever a problem. Browsing is easy and searches are a snap. And it never seems to crash. 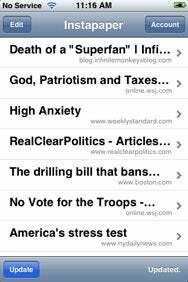 The app also sorts your books by title, author, subject and latest reads. I also have to applaud eReader for letting users choose to either flip pages or scroll text. What sets BeamItDown’s iFlow readers apart from most others is the scrolling. The text scrolls like a teleprompter, and you control the speed by tilting the screen. Anyone familiar with Instapaper Pro will recognize the feature immediately. In Bookshelf, you can scroll text with your finger or press a “play” button and have the text scroll automatically at a speed you can set. But with the exception of the scrolling function, Stanza does a better job at presenting books. If you are compulsive highlighter, the app should let you highlight text with a tap and a stroke of a finger. Prefer to underline instead? Then the app should let you opt for that. The app should let you annotate the text and bookmark as many pages as you like. You should also be able to link directly to passages and references in other works, regardless of whether you own the e-book or even if you do and it’s stored on another computer. That kind of interactivity is probably the greatest deficiency of the e-book apps currently available. eReader lets you select and highlight text, add notes, and look up words in a dictionary—which Bookshelf, Stanza and the Kindle for iPhone apps do not. (You need to buy a reference work in a compatible format and have it open in the eReader; the app won’t work with any other dictionary applications. This is less than ideal.) Classics also offers no way to annotate books. BeamItDown says it is planning to add search and annotation functions for future updates of its iFlow collections, but offers no date certain for when those features will appear. Marco Arment’s $10 Instapaper Pro isn’t an e-book app, but it is a first-class reader with gewgaws and gizmos of enormous convenience that e-book developers would do well to learn from and emulate. The app features a nifty tilt screen feature that lets you scroll text without touching the screen. Anyone familiar with BeamItDown Software’s iFlow reader will recognize the feature immediately. If the tilt feature proves distracting, not too worry: You can turn it on and off with the touch of a button. Instapaper Pro will also mark your place so that if you need to click away, you will return to the exact spot in the text where you left off. The app also displays customized fonts and text sizes, and gives you the option of black text on a plain white background or white text on black. You can also open articles in Safari. Amazon has escalated the e-book wars with its shot across Apple’s bow. But iPhone developers are a clever and wily lot, and Apple is no slouch, either. With some steady improvements, the ideal iPhone app e-book reader may not be just a dream for much longer. For now, though, the best overall book reader is Stanza. For reading Web content, look no further than Instapaper. For the most enjoyable reading experience, dive into the classics of Classics. And if you want the broadest selection and best deals on books for sale, Kindle for iPhone rules the roost.